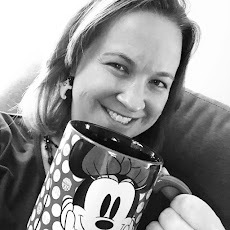 Leg 2 of the Glass Slipper Challenge found me with another early wake-up at 3AM to get ready to join the thousands of women (and lots of men too!) at Epcot for runDisney's Princess Half Marathon. Like other runDisney races, the start time is an invigorating 5:30AM and they ask runners to arrive by 4:30AM at the latest. We boarded our bus from Coronado Springs at 3:45 and were inside the waiting area at Epcot by 4:15. Since we had time to spare and nothing else to do, we opted to get in line to try and meet a princess before the start of the race. We cut it close before the line was closed, but were able to grab a picture with Tiana. Christine and I also found a minute to pause for a quick photo before heading to the corrals. 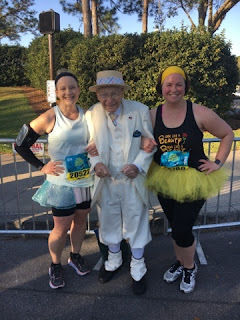 As you can see, I went with a Belle inspired look for the race which was fitting as the race weekend theme was Beauty and the Beast. The starting corrals for this particular race are a good walk from the waiting area. Definitely heed the warnings by the DJ beginning around 4:30 to start walking there. We began heading in that direction around 5:00 and didn't make it to our corral until after the race had officially started. That's a benefit though of being slow - my corral placement was so far back, I didn't miss my starting time! We saw many, many people running hard to try and make it to their corrals before the race started and some early corral runners who missed their start and had to drop back. Regardless of where runners started, everyone was treated to the usual pomp and circumstance that accompanies the start of every runDisney race - fireworks and music! The race featured a number of unique and fabulous character stops. 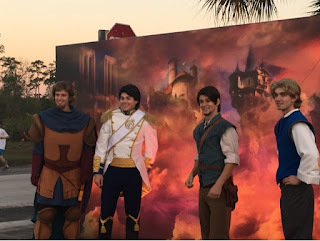 We bypassed the long line for the group of handsome men waiting to greet runners, but don't worry ladies - I grabbed a quick photo as we jogged past. This course takes you from Epcot to the Ticket and Transportation Center and then onto Magic Kingdom. There is nothing quite as exciting as seeing the signs for Magic Kingdom, running down Main Street USA, and through Cinderella Castle. 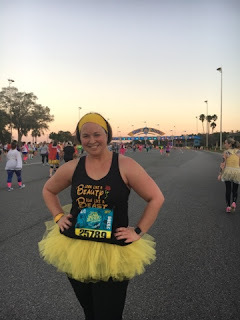 There were a number of character stops in Magic Kingdom, but I was feeling very tired and sluggish from being undertrained and tired from the 10K the day before so we continued to push on to not loose momentum. I had said that I would stop for Gaston no matter how long the line was, but when the line was back past Under the Sea - Journey of the Little Mermaid, I changed my mind and just settled for a quick pic on the way past. After leaving Magic Kingdom, we ran past the Grand Floridian and saw a very famous and familiar face. Many Disney regulars will recognize Richard as the long time greeter at the Grand Floridian. This was one picture I couldn't pass up. As we made our way back to Epcot, I started to really lose it physically. As we were on the bridge crossing into Epcot, I was doing way more walking than running, but I was still moving in the right direction. After entering Epcot, runners circled around the fountain in Future World and then back to the parking lot. The Gospel Choir at mile 13 was just what this exhausted runner needed. Princess Minnie was greeting runners right before crossing the finish line and we were done! 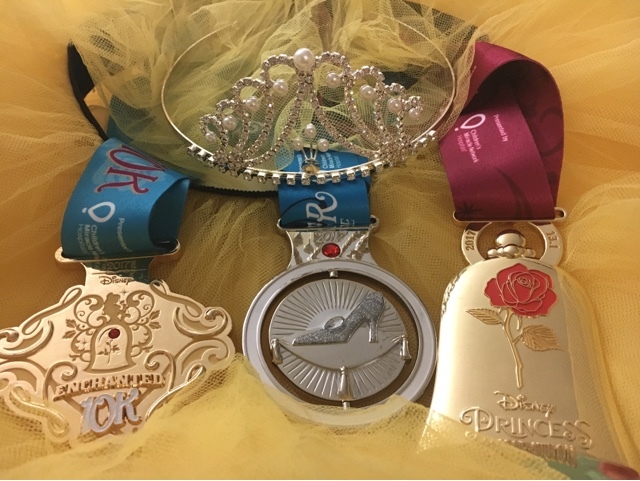 19.3 miles in less than 30 hours was an impressive feat for me and I couldn't have been happier to pick up my beautiful Princess Half Marathon AND Glass Slipper Challenge medals. I also couldn't have been happier to return to the hotel for a shower and lunch that was waiting for me. 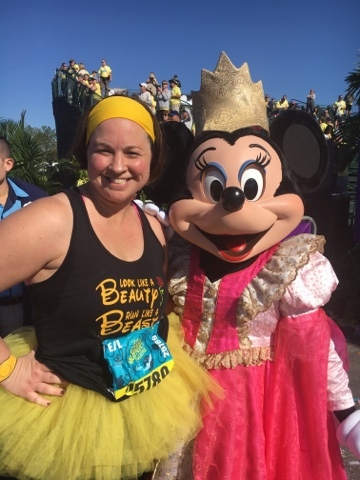 The Glass Slipper Challenge was a memorable weekend and I look forward to my next runDisney adventure!